To all the fellas in the place with Style and Grace– we got a tape for you! Kanye West, aka The Louis Vutton Don, is hot on the heels of success in the realms of music and fashion. Dropping both the Air Yeezys through Nike and The Don through Louis Vutton, Mr. West has decided to add a more suiting moniker for the world to address the cultural icon: Martin Louis The King, Jr. 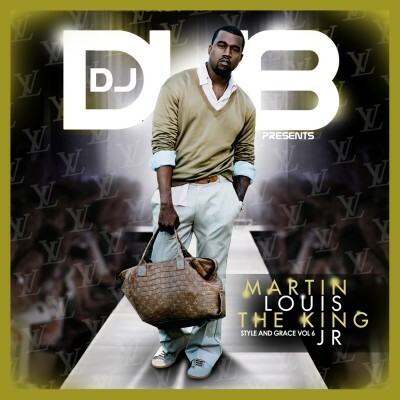 The mixtape, compiled by DJ Dub, features Kanye’s latest releases, collaborations, production, remixes and even some Dub remixes. The mixtape covers the musical spectrum from hip hop to house and is guaranteed to be another classic in the Style & Grace mixtape series Dub is well-known for. Along the way, you’ll hear Kanye alongside artists like Bun B, GLC, Lil Wayne, Pharrell, Kid Cudi, Common, Beyonce, Jay-Z, Big Sean, Mos Def, The Clipse, Ne-Yo and more! Cookin SoulDJ ClassDJ DubKanye WestT.H.E. W.E.A.K.